Home > News & Events > Careers Fair > Careers Fair competition winner! Congratulations to Year 11 Maddie Davey from Court Fields School in Wellington. Maddie was the clear winner for the females and has been awarded with two tickets to a Bristol City FC match of her choice. She is looking at dates with her Dad and will make her selection shortly. Maddie started playing football aged 8, joining Wellington Wildcats where she still plays now for the under 18’s side. Favouring centre-mid field, Maddie has also recently been asked to play for the ladies team too. 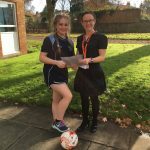 Once she completes her GCSE’s next summer (her favourite subjects are PE and English), football fanatic Maddie has an ambition to study for a diploma in sports coaching at Bridgwater and Taunton College. From there she has big dreams of going to University and then travelling to Australia. Well done Maddie from both The One Step Foundation and Bristol City FC, we wish you well in your fast approaching GCSE’s. You have an exciting future ahead of you, in the meantime enjoy the Bristol City game!